Four people accused in the love triangle stabbing death of a 35-year-old woman at her home on the Campo Indian Reservation pleaded not guilty Wednesday to murder charges. 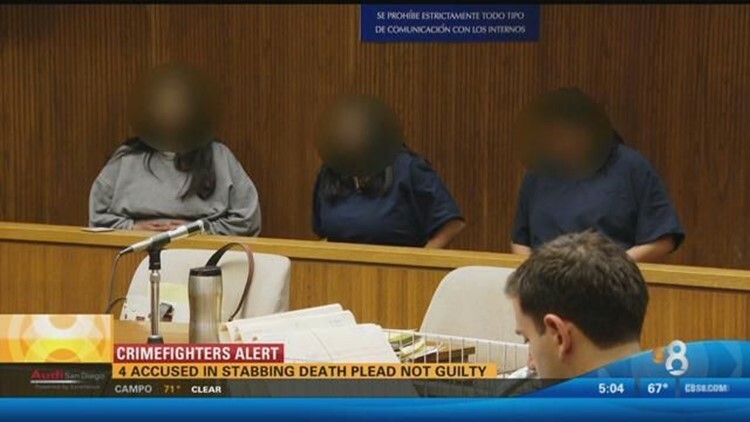 EL CAJON (CNS) - Four people accused in the love triangle stabbing death of a 35-year-old woman at her home on the Campo Indian Reservation pleaded not guilty Wednesday to murder charges. Darrell Wohlford, 38, Cindy Ceballos, 29, Natalie Ceballos, 34, and Casandra Alto, 24, are accused in the death of Christalina Leona Louise Indish. The victim was involved in a relationship with Wohlford, who was also in an intimate relationship with Cindy Ceballos, which had led to recent arguments, according to the San Diego County Sheriff's Department. Investigators believe the defendants drove to the victim's home last Saturday and confronted her there. Authorities found her body on the front stairs at her residence at 36380 Tusil Road in Boulevard. Wohlford, who has two prison priors, was ordered held on $2 million bail. Cindy Ceballos, who was also charged with an allegation of personal use of a weapon, was ordered held in lieu of $1 million bail, while Natalie Ceballos and Alto had bail set at $500,000 each. All of the defendants face life in prison if convicted. A readiness conference is scheduled March 10, and a preliminary hearing was set for March 14.